Objective: This study aimed to investigate the application of preoperative three-dimensional model design in radioactive particle implantation for advanced pancreatic cancer, and accordingly analyze the effect of particle implantation in the treatment of advanced pancreatic cancer. Methods: The clinical data of 63 patients with advanced pancreatic cancer treated with particle implantation from January 2009 to June 2015 in the General Hospital of Chinese PLA were retrospectively analyzed. 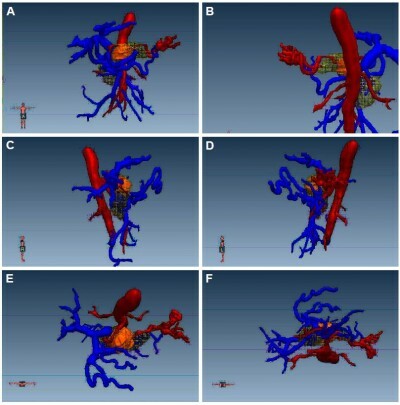 The implantation design was conducted using the FitMe three-dimensional model reconstruction software for all patients before the operation to explore the significance of preoperative three-dimensional model design in guiding operation. These data were compared with the general data, postoperative recovery, and follow-ups of patients with advanced pancreatic cancer, who underwent conservative treatment at the same time period, in order to explore the effect of particle implantation in the treatment of advanced pancreatic cancer. Results: In the 63 patients with advanced pancreatic cancer who underwent particle implantation, the average number of implanted particles was 53.4±18.7. Gastroparesis occurred in 17 patients and pancreatic fistula occurred in 13 patients after the operation, and no perioperative death occurred. Follow-up results: In the particle group, the relief rate of abdominal pain was 90.9%, the 1-month, 6-month, 1-year, and 2-year survival rates were 100%, 58.7%, 22.4%, and 9%, respectively, and median survival time was 10.4±0.7 months, which were significantly higher than patients in the control group (P<0.05), especially in patients with stage III pancreatic cancer. Conclusion: For patients with advanced pancreatic cancer who could not undergo radical resection, radioactive particle implantation is an effective treatment, while the use of a preoperative three-dimensional model design for operation planning can maximize the effect of radioactive particles.